The Rezortify's Blog > For Foodies > Best Eating Joints At Ahmedabad : Satisfy Your Munchies Deliciously in The City! If you have got the munchies in the city of the Sabarmati, we are here to bat down your hatches! So before the food gets cold, let’s chow it down! 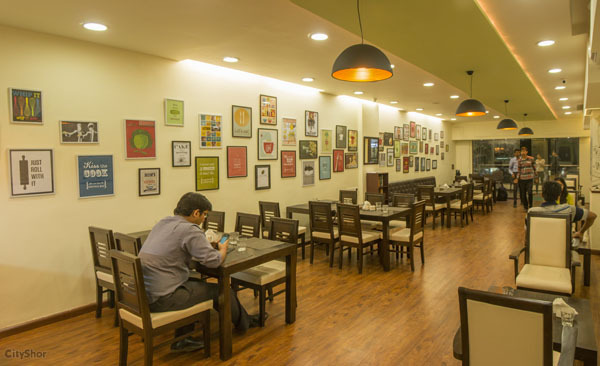 Presenting the list of best restaurants in Ahmedabad! We have here assembled the real life tastes of our regular reader, Mansi. Let’s see how she ranks the best eating joints at Ahmedabad. Nini’s Kitchen – Juice lounge and rollacosta – perfect spot for food and music lovers! You step into this richly decorated place, and you will be awestruck by really impressive artistic murals, food quotes and those frames. Who says books can’t make their way at a restaurant? Nini’s kitchen takes care of that! They recently changed their name to Nini’s kitchen due to some controversies over tastes and they ended up operating on their own terms, bidding adieu to the franchise. Probably it is the best place to eat in Ahmedabad. Good news for the foodies especially the health lovers! Famous for rolls, but they will create a special corner of liking in your heart by the time you leave. By offering places to energy boosters in the menu and surprising by handing over the handmade chocolates at the counter instead of mouth fresheners, Nini’s kitchen is sure to make you a regular visitor! Price: 600 Rs for two people approx. Sankalp – The escapade for south Indian lovers! If Dosa if one of your definitive food, that no matter what you are always hooked to it, go no further than Sankalp! An entry might give a creepy look at the first sight, but do not underestimate the power of this good restaurant in Ahmedabad. Passing through some narrow passages, you will be mouth watered by the spicy aroma of Sambhar and the ambiance! Yes, Sankalp lies there. Sankalp offers an array of varieties in Dosa, Idli, Uttapam… Their sambhar has a different element quite different from what Northies have. They will make it sure that their guests chew the paan before they leave! The ebst part! Calling out all culture lovers here! Vishalla is the place that will soak you down to the cultural extravaganza of the Gujarati and Kathiawadi food. Creating a village like atmosphere, kids are going to love the place for sure. Puppet shows and the man in turban serving you the food in urban – an awesome experience indeed! The food might turn you down if you are not the greatest fan of Gujarati food with sugary flavor in everything you eat. Overall, a must try experience. One of the best places to eat in Ahmedabad! Barbeque nation – experience the customer service! You have your friends from Delhi and Mumbai and you are thinking where to go? Barbeque Nation might be the answer. With super-fast service and equally amazing food, it is answerable to the non-veggies too! The place is good and the customer service excellent and one of the best non-veg restaurant in Ahmedabad. Few places out there who will really bother to ask for the feedback the next day and even take it seriously! p.s. – Their menu keeps on changing with very festival! Surprises on the finger tips! Further, do not visit it on weekends, waiting queue could be irritating.